This is more of a curiosity question than anything else. 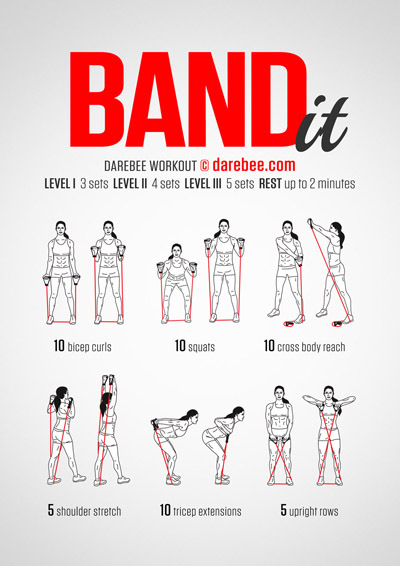 I was wondering if there are any workouts or if anybody knows of any routines that use resistance bands. I got a set of three of them for my 40th birthday last fall, but they have gotten little use because I have next to no clue how to use them safely. Reality for me is this is more of a "wonder if somebody might know" question as I'm currently on Foundation Light and have no plans on starting a second program in tandem (not a good idea for me); just wanting to do a little thinking ahead because the Foundation Light program will eventually technically conclude (just finished day 11) and I will need to figure out what to do from there eventually. Scaredandscarred ... I have to ask why you are doing the Light version rather than the standard version. Are you in injury recovery? If you are struggling with the Difficulty I Program, you may need to take on a Difficulty II Program. There are only a few. Cardio Go is one, Foundation is another. I hope you enjoy your journey to a better life. Although that is a level 3 workout, don't discount it as the difficulty is in part down to the strength of the band used and how tight you have it. I've also got one X-strong tubular one which comes with an attachment to retain it in a door jam so you can do other exercises with it. They can make workouts harder but won't give you the same level of workout as weights. I'm happy to give you some other ideas for exercises if you want with them. It's certainly worth a google and youtube search though as you can find ones in there no doubt. Scott ... not nearly the benefit of weights, no, but if you 'trip' over them in the dark? No bruised (or broken?) toes. DaithiMeyer It's complicated sir, but one of the factors is that I am, for all intents and purposes, starting over. I concede FL is a cake walk for some, but I need the confidence boost among other things. There's more to it, but it involves stuff that you don't really want to know and I don't feel comfortable sharing (yet). Scott That's fair enough, and it doesn't surprise me all that much that I may need to look at other sources. After all, this is mostly a bodyweight program site. I get that. Just wanted to put it out there as a "what if" knowing I have them on hand. FL isn't necessarily a cake walk, we all start our fitness journey at different levels. I started with Foundation but I had to struggle through it on some days it absolutely killed me and I'd end up as a sweaty mess doing workouts that now I wouldn't even break sweat on. Take the mindset of celebrating the victory of finishing those workouts that challenge you, it's one step closer to being a better you. Stay positive and post in here regularly as we will all help to keep you motivated. I've lost count of the times where someone has picked me up when I've struggled. Full circuit absolutely killed me some days and it was only when Neila Rey messaged me to say that actually it was designed to be hard and in fact I was doing well that I thought, well actually I am. Keep doing what you are doing and trust the process of the programme, you will see the benefit at the end. You can do it.